“The World” is a massively multiplayer online game played by more than twelve million people across the globe. 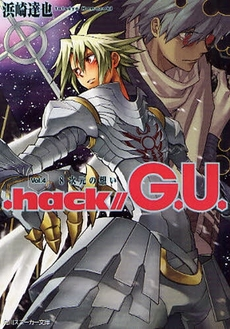 Within this virtual world Haseo, a PKK (Player Killer Killer), continues an endless fight. Everything he does is for the sake of the girl Shino, who back in the real world, is hospitalized by an unexplained coma. However, on finally meeting with his sole lead, a PK called ?Tri-Edge,? Haseo is dropped back to Level 1 by a mysterious power! Can Haseo save Shino now that he has lost all of his abilities? It's everything better alone, It's life about the gold or glory, this all what marvelously depicted young child thinks of the world, before he meets her. It's not love, but friendship in best of world as she shows him a lighter side to world. There's those senseless and pointless moments of sitting in grass, eating mooncakes, adventuring with friends that fills you with brim of warm and smiles, until tragedy strikes and and he loses more then a friend, but the light in world.